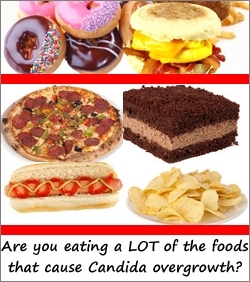 Eating Foods That Cause Candida? Avoid Them For Best Candida Defense! Always remember that your diet is one of the main causes of Candida overgrowth. So controlling the most important of all Candida causes is your best defense method, as it helps you to reduce or eliminate the debilitating symptoms of Candida overgrowth and the many related health problems that take the joy out of your life! Before anything else, you should know that Candida Albicans is a type of yeast that feeds on sugar and thrives in high acidity. Obviously, the things you must eliminate from your anti-Candida diet is sugar in all its forms and everything that creates high acidity in your body (see the list below). Yes, cutting these foods that cause Candida can be a decision tough to make and even tougher to stick to, because a lot of these are popular foods. But you’ll see, the results are going to be spectacular! Try a “Candida defense” diet for a month – take a look at some delicious sample menus from our Candida-free diet. Then, when you finally beat the Candida infection, the resultant weight loss, return of energy and vitality, subsiding of mental, digestive and skin problems, your sense of general wellbeing, are all well-worth of exercising your discipline for a few weeks. That’s a LOT, I know. It’s time now for the bit of good news. Try to avoid these foods that cause Candida until you bring your system back to a healthy balance – typically about a month, more or less depending on your general health and the severity of your Candida symptoms. Then, you can start to gradually bring them back in your diet, according to the Candida diet guidelines. First, if you want to put at rest the life-disrupting yeast symptoms, you must completely eliminate from your diet the foods that cause Candida listed above. Second, remember that as Candida overgrowth is killed, your health and immune system must be brought back on track through an adequate supply of vitamins, minerals, enzymes, and specific helpful foods as per the guidelines mentioned above.